Before we begin, let’s state a few important theorems. THEOREM: If two angles inscribed in a circle intercept the same arc, then they are equal to each other. THEOREM: If an angle inside a circle intercepts a diameter, then the angle has a measure of \(90^\circ \). Now let’s use these theorems to find the values of some angles! 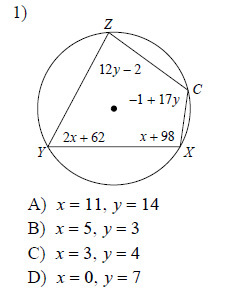 EXAMPLE: Find the measure of the angle indicated. SOLUTION: First we see that \(\measuredangle DNC\) and \(\measuredangle DEC\) both intercept the same arc. So, by our first theorem, we know that \(\measuredangle DNC = \measuredangle DEC\). And since \(\measuredangle DNC = 37^\circ \), we conclude that \(\measuredangle DEC = 37^\circ \). Next, since \(\measuredangle EDC\) intercepts a diameter of the circle, we can conclude, by our second theorem, that \(\measuredangle EDC = 90^\circ \). So two of the angles in triangle \(EDC\) are \(90^\circ \) and \(37^\circ \). Then, by using the fact that the tree angles of a triangle must sum to \(180^\circ \), we know that the measure of the desired angle is \(53^\circ \). 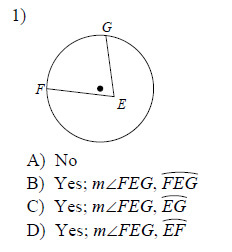 EXAMPLE: Find the measure of the indicated angle. SOLUTION: Since \(\measuredangle NBM\) and \(\measuredangle NLM\) intercept the same arc, they are equal, so that \(\measuredangle NLM = 52^\circ \). 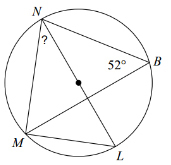 Next, since \(\measuredangle NML\) intersects a diameter of the circle, we know that \(\measuredangle NML = 90^\circ \). Then since two of the angles of triangle \(LMN\) are \(90^\circ \) and \(52^\circ \), we know that the desired angle must be \(38^\circ \), by the fact that the three angles of a triangle must sum to \(180^\circ \). 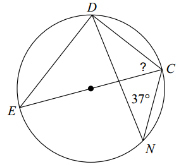 Solution: The desired angle is \(38^\circ \). State if each angle is an inscribed angle. If it is, name the angle and the intercepted arc. 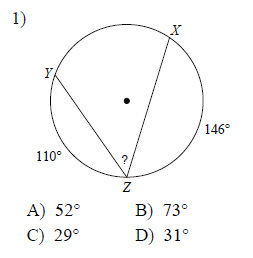 Find the measure of the arc or angle indicated.